The sudden reversion of Washington to a ‘war on terror’ pretext for intervention in Syria has confused western audiences. For three years they watched ‘humanitarian intervention’ stories, which poured contempt on the Syrian President’s assertion that he was fighting foreign backed terrorists. Now the US claims to be leading the fight against those same terrorists. But what do Syrians think, and why do they continue to support a man the western powers have claimed is constantly attacking and terrorising ‘his own people’? To understand this we must consider the huge gap between the western caricature of Bashar al Assad the ‘brutal dictator’ and the popular and urbane figure within Syria. If we believed most western media reports we would think President Assad has launched repeated and indiscriminate bombing of civilian areas, including the gassing of children. We might also think he heads an ‘Alawi regime’, where a 12% minority represses a Sunni Muslim majority, crushing a popular ‘revolution’ which, only recently, has been ‘hijacked’ by extremists. The central problem with these portrayals is Bashar’s great popularity at home. The fact that there is popular dissatisfaction with corruption and cronyism, and that an authoritarian state maintains a type of personality cult, does not negate the man’s genuine popularity. His strong win in Syria’s first multi-candidate elections in June dismayed his regional enemies, Israel, Saudi Arabia, Qatar and Turkey; but it did not stop their aggression. Syrians saw things differently. 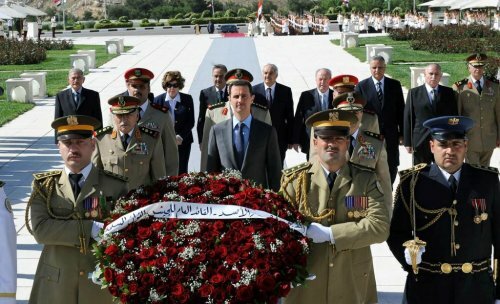 Bashar was thought to maintain his father’s pluralist and nationalist tradition, while modernising and holding out the promise of political reform. Opinion polls in Syria had shown major dissatisfaction with corruption and political cronyism, mixed views on the economy but strong satisfaction with stability, women’s rights and the country’s independent foreign policy. The political reform rallies of 2011 – countered by pro-government rallies and quickly overshadowed by violent insurrection – were not necessarily anti Bashar. The Syrian Muslim Brotherhood and other sectarian Islamist groups did hate him, along with the secular state. Yet even these enemies, in their better moments, recognised the man’s popularity. In late 2011 a Doha Debates poll (created by the Qatari monarchy, a major backer of the Muslim Brotherhood) showed 55% of Syrians wanted Assad to stay. Armed Islamists went further. In 2012 Reuters, the UK Guardian and Time magazine reported three ‘Free Syrian Army’ (FSA) leaders in Aleppo saying the Syrian President had about ’70 percent’ support; or that the local people, ‘all of them, are loyal to the criminal Bashar, they inform on us’; or that they are ‘all informers … they hate us. They blame us for the destruction’. 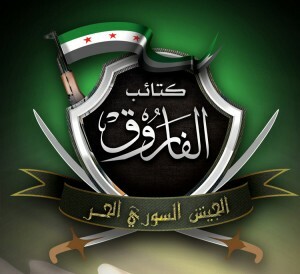 All three FSA groups were Islamists on good terms with al Qaeda. None of these revelations changed the western media reliance on Muslim Brotherhood-aligned sources, ‘activists’ or ‘moderate rebels’. They relied, in particular, on the UK-based Rami Abdul Rahman, who calls himself the ‘Syrian Observatory of Human Rights’. Such sources kept ‘Bashar the Monster’ alive, outside Syria. Central to the Bashar myth are two closely related stories: that of the ‘moderate rebel’ and the story that conjures ‘Assad loyalists’ or ‘regime forces’ in place of a large, dedicated national army, with broad popular support. 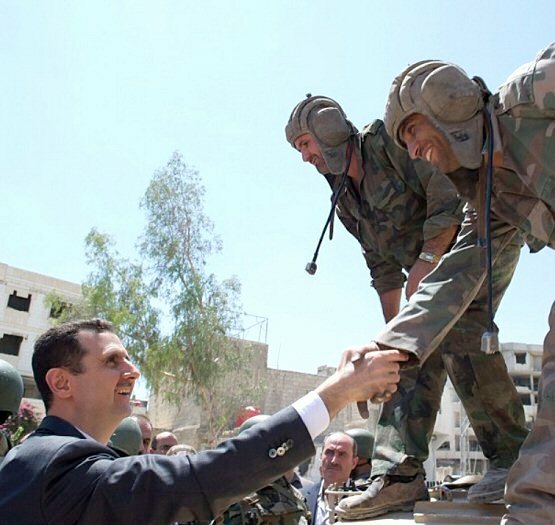 To understand the Bashar myth we have to consider the Syrian Arab Army. At over half a million, the Army is so large that most Syrian communities have strong family links, including with those fallen in the war. 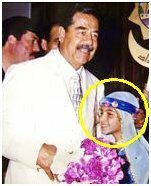 There are regular ceremonies for families of these ‘martyrs’, with thousands proudly displaying photos of their loved ones. Further, most of the several million Syrians, displaced by the conflict, have not left the country but rather have moved to other parts under Army protection. Quite a number of Syrians have criticised President Assad to me, but not in the manner of the western media. They say they wanted him to be as firm as his father. Many in Syria regard him as too soft, leading to the name ‘Mr Soft Heart’. Soldiers in Damascus told me there is an Army order to make special efforts to capture alive any Syrian combatant. This is controversial, as many regard them as traitors, no less guilty than foreign terrorists. The group is named after a top al Qaeda leader and senior lieutenant to Osama bin Laden. What of the ‘moderate rebels’? Before the rise of ISIS, back in late 2011, the largest FSA brigade, Farouk, the original ‘poster boys’ of the ‘Syrian Revolution’, took over parts of Homs city. One US report called them ‘legitimate nationalists … pious rather than Islamists and not motivated by sectarianism’. The International Crisis Group suggested that Farouk might be ‘pious’ rather than Islamist. The Wall Street Journal also called them ‘pious Sunnis’ rather than Islamists. The BBC called them ‘moderately Islamist’. All this was quite false. Syrians in Homs said Farouk went into the city with the genocidal slogan: ‘Alawis to the grave, Christians to Beirut’. Shouting ‘God is Great’ they blew up Homs hospital, because it had been treating soldiers. The churches blamed Farouk for the ethnic cleansing of more than 50,000 Christians from the city, and for the imposition of an Islamist tax. Has the Army committed abuses? Probably, but mainly against the armed groups. There is some evidence of execution of foreign terrorists. That is certainly a crime, but probably has a fair degree of popular support in Syria, at the moment. The main constraint on such abuses seems to be the army order from ‘Mr Soft Heart’, to save the lives of Syrian rebels. However, despite the repeated claims by sectarian Islamists and their western backers, there is no convincing evidence that the Syrian Army has deliberately bombed and gassed civilians. Nor would there be a motive for it. Nor does the behaviour of people on the streets support it. Most Syrians do not blame their army for the horrendous violence of this war, but rather the foreign backed terrorists. Tim Anderson is a Senior Lecturer in Political Economy at the University of Sydney. He has researched the Syrian conflict since 2011 and visited Syria in December 2013. Dit bericht werd geplaatst in America, Anarchism, Barack Obama, Culture, Education, History, Holism, Honesty, Human Rights, Humanism, Imperialism, Iran, Iraq, Islam, Life, Middle East, News, Politics, Religion, Syria, White House. Bookmark de permalink .